Having an extremely slow or intermittent internet connection can often be as disruptive as no internet at all. Here, we will walk through the most common causes of slow internet and internet 'drop outs', and how to troubleshoot them yourself. It's important to note the difference between a slow and intermittent connection, compared to a complete outage. If you have NO internet connection at all please refer to our other internet troubleshooting guide. What actually defines slow internet? Remote Desktop Connections, Citrix, etc are very delayed or unresponsive. If you're sure that it's not the service or website you're trying to use which is at fault, then the above are key indicators of slow internet. If only one particular service is running slowly, for example a remote connection to a company server, but everything else is fine, then it's likely not the internet connection at fault. In these cases the supplier for that service should be contacted first to perform troubleshooting. It's very helpful to get a numerical value for your internet speed. This helps us a lot and gives everyone a point of reference for just how bad the problem may be. Performing a test also helps you realise if the problem is at your end, or the service's end and so is an important step in this process. Any of these tests will give you a value in 'Mbps', this can be compared directly against the client's assigned maximum to see, in very basic terms, how fast this particular PC's internet is at the moment. If the test result is significantly (more than 25%) below the assigned maximum, then it's likely there are some issues which need to be investigated. Note: the maximum assigned bandwidth is theoretical and shared among all devices on that client's network. You should never expect to get 100% of the assigned maximum in a speed test. If you've done the above and you're now sure that you have a slow internet issue, the first thing to check should always be bandwidth usage. If the assigned bandwidth is being completely utilised (or 'maxed out') then it will give the impression of extremely slow internet, or a connection drop out. This applies to both wired and wireless (Wi-Fi) users. To put it into real world terms, imagine 20 people all trying to walk through a narrow doorway at the same time; it's slow due to the congestion, and some people have to stand back and wait for the others to finish walking through first meaning they are delayed, some might even give up and try again later. This is what happens when too much data is pushed through a limited bandwidth assignment, data is delayed and some is 'dropped'. 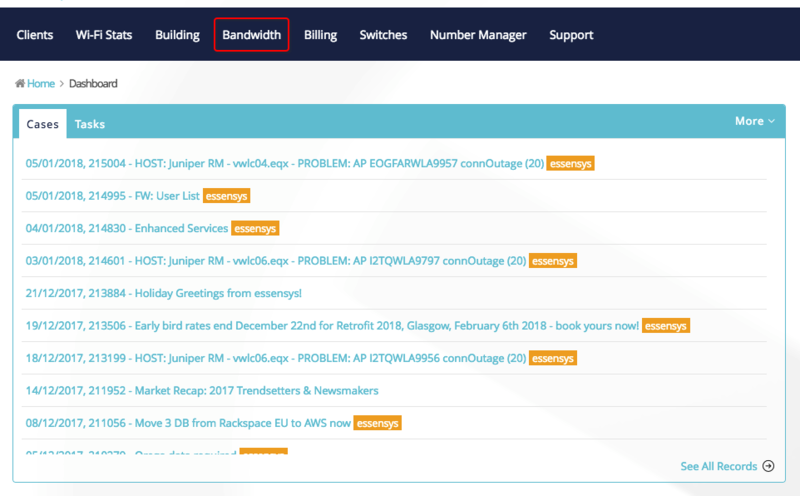 We provide bandwidth graphs for all internet customers on Connect. These are available under Bandwidth option in your navigation. If you've never viewed the bandwidth graphs before we strongly suggest you read through our detailed introductory article, found here. Make sure to select the correct client on the right side of the screen. At this point, it's important to note the differences in bandwidth assignments. Not every site uses all of these so if you don't recognise the name from your services, don't worry. You can check if a client is using Dedicated or Shared by looking at their services in Client Manager. Dedicated bandwidth is, as the name suggests, dedicated exclusively to that client. It's reserved and can only be used by that customer. If they 'max out' their connection then they only affect themselves. Shared bandwidth, often referred to as 'Standard' and 'Superfast' connections are a collection of multiple customers sharing a pool of bandwidth. Usually this pool is considerably larger than the bandwidth offered by a dedicated connection, however it's shared among more people. This means that if the shared bandwidth pool is maxed out then everyone assigned to it will suffer slow internet and other issues. The graphs show download (blue) and upload (yellow) over time. You can drag and drop the time period on the bar just below the graph, and you can change the view to show what 'applications' are being used. Generally, you will check to see the client's usage, and if they are reaching their maximum bandwidth assignment (the 'threshold'), then you narrow down the time period and check the applications to see what is utilising the most data. With this information you can feed back to the client to tell them what is happening, for example 'someone was watching YouTube at 10am, this is what maxed out your connection'. Note: the application view is an estimation, and may not always be 100% accurate, we can only attempt to be specific about popular, mainstream services such as YouTube, Twitter, iTunes etc, everything else will show under general protocols like 'download' and 'streaming'. Below are two examples of how you can use the bandwidth graphs to find what is causing slow internet and tackle it yourself without a case. It's important to note that these are NOT technical faults, it's not something we can fix, it's your users simply pushing their assigned bandwidth to the max. Both of these scenarios can be resolved by a changing assigned services and user habits. 'Company X' has complained that they've experienced very slow internet a couple of times throughout the day, one of the users tried calling a customer over skype and it kept dropping out. They said it was okay in the morning but it got really bad around lunch time. We can see that, from the header, Company X has Dedicated bandwidth, and they have a 10mbs bandwidth threshold. At around 12pm and 2pm there were two long periods of maxing out, during those times Company X would have experienced very slow internet, or intermittent drop outs due to the congestion. This matches up with their explanation of the issue and the rough time period mentioned. Now we know they were maxing out their connection, we can click on 'Applications' and try to get a better idea of what was causing it. From the above, we can see that over the same time period Company X's main activity was Netflix, HTTPS Streaming is also usually a video service, so we can assume it's also coming from Netflix. Again, you can drag the time line below the graph to narrow it down to periods as small at 10 minutes to see what the usage was. From these two pictures we can make the assumption that Company X's bandwidth spikes were caused by a user using Netflix. This is good information to pass onto the client directly, they might not be aware that someone was doing it! It also helps raise awareness of the issue so they can better manage their usage in the future. The site management staff at 'Example Offices' sell a 25mb/s Shared internet package to some of their clients. Recently a few of them have commented that occasionally the internet is very slow and drops out, one of them is quite techy and ran some tests themselves to reveal they were only getting 10mb/s, less than half that is promised! What's going on? From the bandwidth graph we can see the usage for the standard bandwidth for all clients. For this day there was a few points where it hit the maximum threshold. Just as dedicated suffers from this, all users within the shared pipe will be affected by bandwidth congestion. Shared services are generally more susceptible to being maxed out as there are a lot more users involved. As this is a shared 'pipe' we can see a breakdown of which company is using the most over this time period by clicking 'Client Breakdown' on the right. The client breakdown shows that our 'techy' client, Big Data Company, is unsurprisingly using a lot of data. Following closely behind them in terms of usage is Business Stuff Ltd. Combined these two clients make up the large majority of all of the standard bandwidth usage. Upon checking we found that Big Data Company had expanded their employee count to 20, all of them doing quite data intensive tasks. We can conclude, from the information above, that it's not suitable for Big Data Company to remain in the standard pipe, especially with it's fairly low limit of 25mb/s, we should recommend that they take out a dedicated bandwidth service instead. This would improve everyone's internet experience. It wasn't Bandwidth, now what? Raise a detailed case! Is it happening over a wired or a wireless (Wi-Fi) connection? - This is important as Wi-Fi is more susceptible to slow speeds and drop outs. How long has it been happening, and to how many people? - This helps us track the scale of the issue, and look for any evidence of problems. - If it's everyone in one company, please still specify 'all users within company x'! Have you performed a speed test? What is the result? - Refer back to the 'Test it!' section above, we need a number to worth with! - If only one particular service is slow, but everything else is okay, then it's likely not the internet connection which is the problem! My client Company X has been complaining of slow internet this morning. They use wired connections to their PCs and mostly are having trouble downloading files from their company server, but other things like Skype aren't working either. We did a speed test and the result was 1.3mb/s when they are assigned 10mb/s, can you help please? Remember that any extra detail is very helpful to us! Things like switch port numbers, previous case history, MAC addresses of the wireless access point they are using for example.